Though Dante’s Inferno is nearing 2 years old, I purchased it recently having gone on sale at The Source for $4.99. It was a bargain. I wanted to play an action-heavy, thoughtless, hack and slash. And for that, I received what I wanted. The developers made no reservations about the game: it’s a blatant rip-off of God of War, an exclusive property to the Playstation. However, Dante’s Inferno opened up that console barrier by being accessible on both the PS3 and Xbox, in an attempt to satiate Xbox owners who didn’t own both machines. 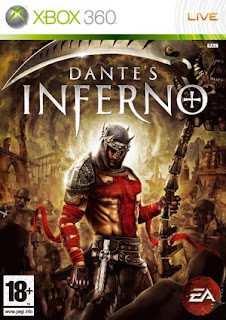 Dante’s Inferno is loosely based on the 14th century poem of the same name.Y ou play as Dante Alighieri, a holy crusader who dives into Hell to save his lover’s soul from the clutches of Lucifer. But the feat is not so easily accomplished as Dante must dive deeper, within the 9 circles of Hell, combating demons and devilry along the way. Much like God of War, Dante’s Inferno is a straight up hack and slash, with minimal focus given to the story. Not that there isn’t a story, there is. But it’s not one that begs the attention from the player. Story is secondary, maybe even tertiary to the gameplay. Much like GoW, you’re given a light and strong attack, evasion techniques, and a few spells. In some fights, you’ll be prompted by quick-time-events that you’ll need to follow in order to defeat your foe. You’ll wash, rinse and repeat for about an hour per level before running into a boss. The game incorporates RPG elements to it. You’re given two tech trees: holy and unholy. Spending points on either side will unlock abilities, combos, upgrades and enhancements for Dante. The points you use are gained through defeating enemies or from statues located around each stage of Hell. But how far you go in each tech tree is dependent on the choices that you make while executing enemies. With certain enemies, you are given the choice to either absolve or punish them for their sins. The former would contribute towards your holy level while the latter, unholy level. Additionally, increasing your holy levels would increase the power of your projectile offence while with unholy, your melee skills are strengthened. Another addition to your arsenal are relics (equipable items) that are scattered throughout the levels. Equipping relics will provide passive upgrades, be they increased defence, offence or some other stat boost. Perhaps the most fun thing about the game is the bosses. Visually, they are grotesquely designed and are sort of like puzzles in themselves, requiring you to figure out their attack patterns and watch out for visual cues. Because they are the biggest challenges in the game, they offer the most gratification with each victory. The visual design of the game ranges from outrageously ridiculous to terrifying. I can’t even begin to describe the boss for the Lust level. The babies. The damn babies! If you Youtube the boss, you’ll understand the ridiculousness of it. At the same time, some of the level design evokes a good sense of terror. Climbable walls are strewn with bodies, begging you to save them or taunting you as you climb over them. It is frightening. Where the fault lies is in the repetitiveness of the gameplay. Hacking and slashing enemies are fine, but enemies vary only slightly as you progress deeper into Hell. In addition, the game doesn’t offer much in the variety of puzzles or challenges. It’s not too demanding of a game until you get to the bosses. Unfortunately, all the moments in between are pale in comparison. Despite it being a rip off and some shortcomings in the game, I still had fun with it. But perhaps I only enjoyed it because it justified the amount of money I paid for the game. I wanted a mindless action game, and I received it. If you see it in the bins for $5, it’s worth a pick up. Til next time, later geeks!